This is another tasty way to use up an abundance of garden tomatoes. It is a rich and thick sauce. Also wonderful on omelets and pizza burgers. I already make 3 or 4 batches but it goes so fast in our house that I need to do even more! This recipe starts out with tomato puree. Depending on how you prepare your tomatoes the amount needed will vary. I start with 4 pounds of whatever type of tomatoes I have an abundance of (cored, halved, scraped out the seeds and pureed in the blender). This is an easy way to prep tomatoes since you leave the skin on. This is also a great way to start marinara or spaghetti sauce with all those extra tomatoes. If desired, you can buy tomato puree. Over medium low heat, heat oil and butter in saucepan. Add chopped onion, sprinkle with 1 tbsp. of sugar. Saute for approximately 15 minutes. Add garlic, saute for another 5 minutes. Add puree, paste, spices and remaining 1 tbsp. of sugar. Bring to a gentle simmer, put lid on and simmer 1 hour. Stir periodically. Set cover ajar for steam to escape (you might want to put splatter shield on saucepan and then reset cover to avoid splatters!) and gently simmer for another hour or until desired thickness. Cool. Label freezer bags or containers, spoon sauce into container. I use 8-oz. jelly jars (freezer safe) and fill to the neck line. 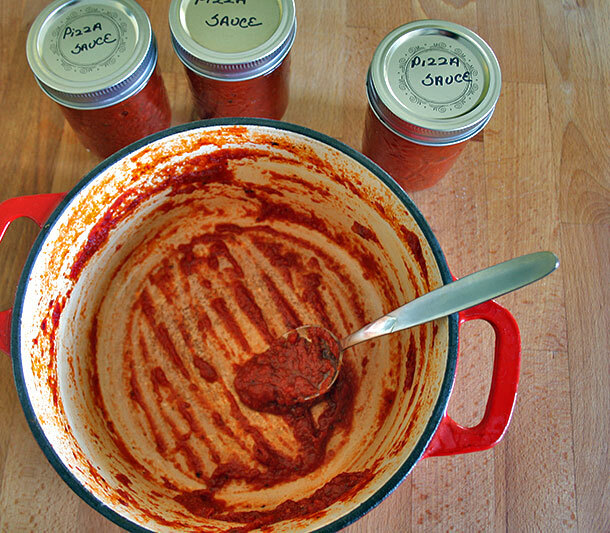 I get enough sauce out of one jar to cover 2 pizzas.